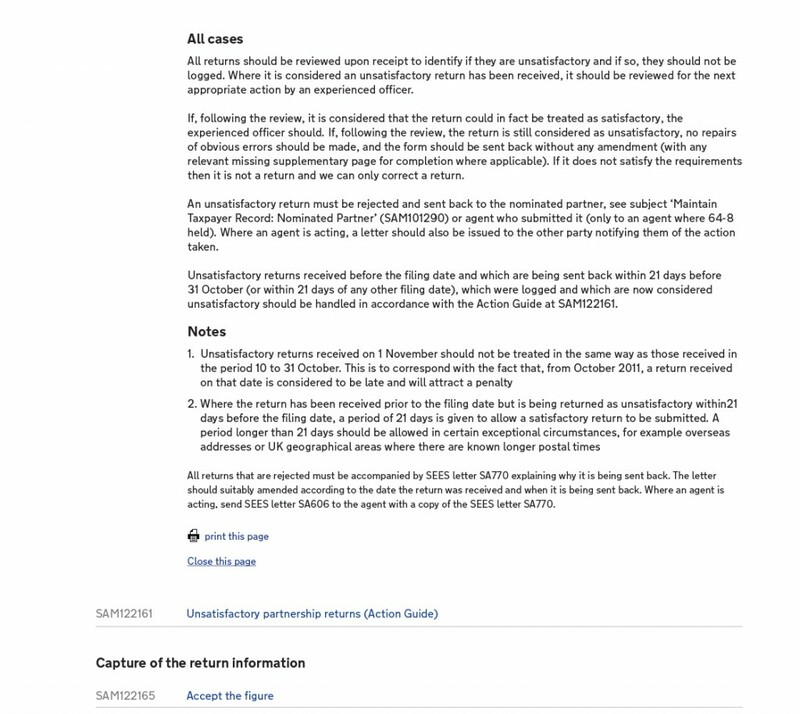 The HMRC manuals are HMRC's internal guidance for staff. 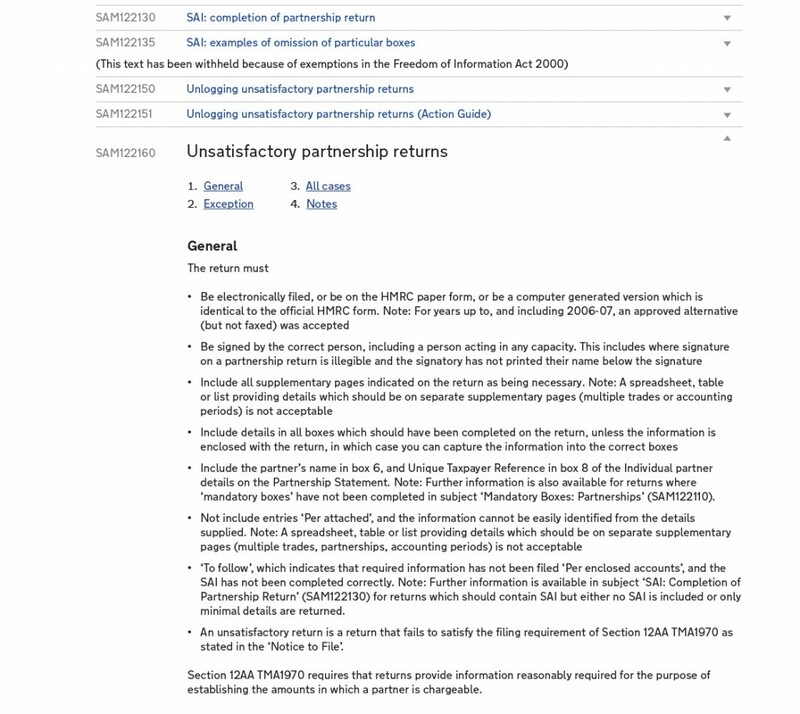 HMRC publish these for taxpayers and their advisors in accordance with the Freedom of Information Act 2000. There are around 300 manuals containing approximately 80,000 pages of content. They are often used by tax agents and tax advisers because they represent the HMRC view on many parts of complex tax law. Some text in the manuals is withheld from publication because of exemptions in the Freedom of Information Act. 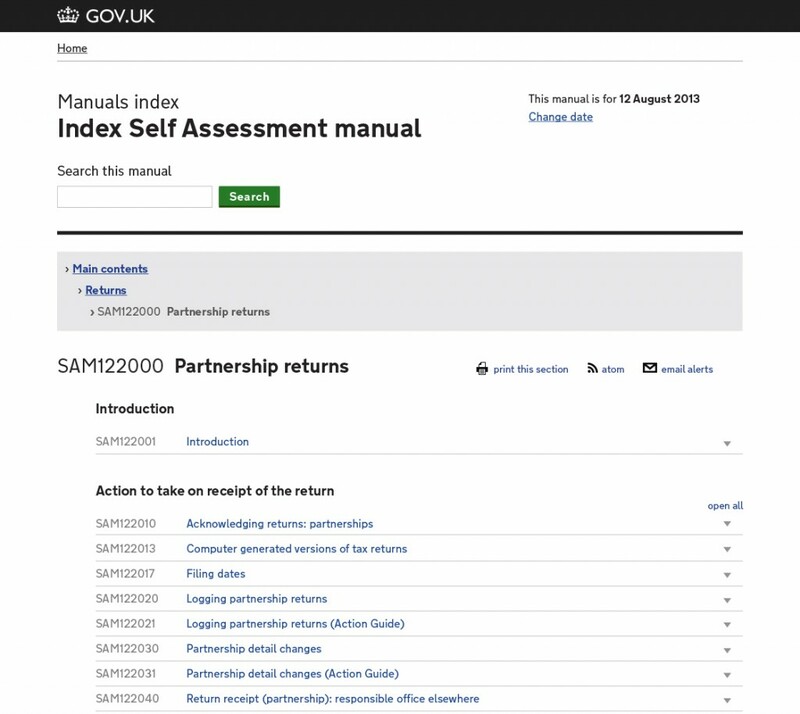 Unlike much of the content that moves to GOV.UK, GDS won't be editing the manuals. 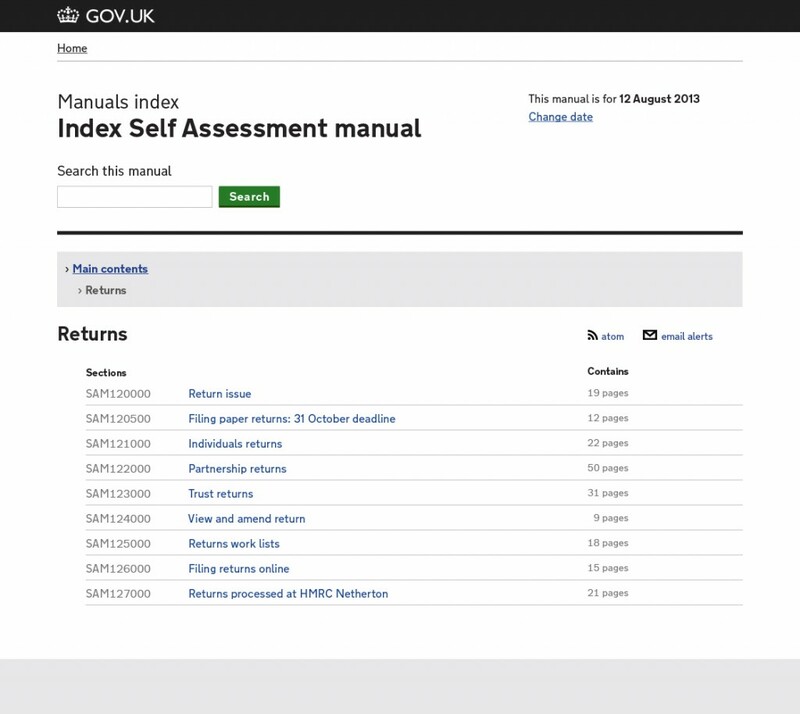 These will move to GOV.UK and will be repurposed into a format that is easier to search, easier to browse, easier to view and easier to print. As with all work at GDS, our starting point for identifying how we should transition the manuals to GOV.UK is to start with user needs. There are many possible user needs for the manuals. One of the main user groups is tax agents and advisers. I am a solicitor and I need to view a page of the manuals at a particular date in the past so that I can find the correct information I need to advise my client. 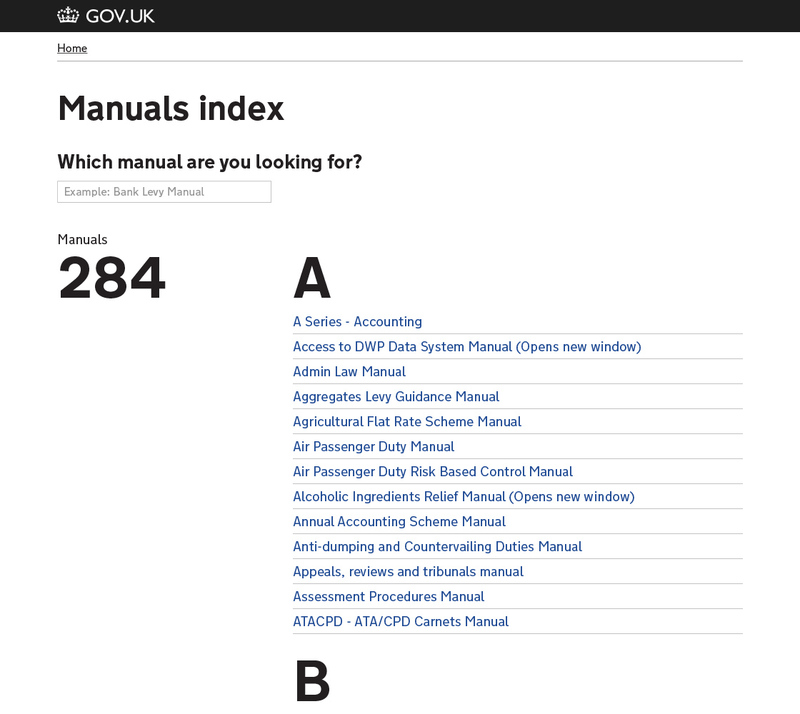 The top level index of manuals is searchable using the search box that dynamically filters the list below. 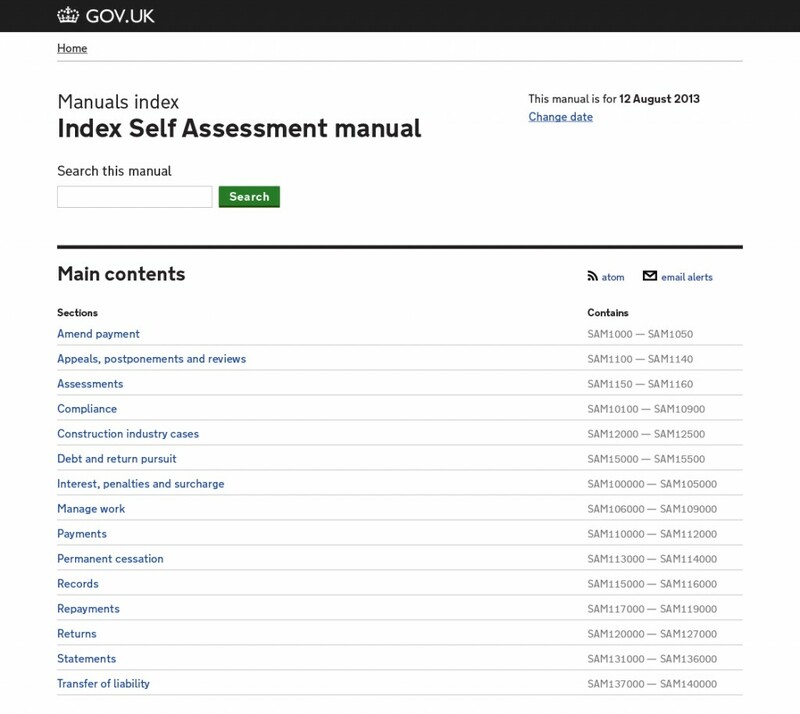 The top level of the self assessment manual. We have moved the references to the right to give more prominence to the title on the left You can search through just this manual using the search box. Stepping deeper into the manual you are given a list of the sections and the number of pages in each section. On the top of the page there's an option to change the date to see the manual as it was at a particular date in time. This is similar to the functionality in the Trade Tariff on GOV.UK and the FCA Handbook. Opening a section of the manual gives the option to expand multiple pages in the manual. Note the email alerts, atom feed links and print options for a whole manual or sections of the manuals. A page of the manual opened up within the list view. Each page has an option to print, or to print all pages. We will be using this feedback to help develop our next round of designs. We got further feedback on the manuals when we met with the Tax Information Group on 17 September.